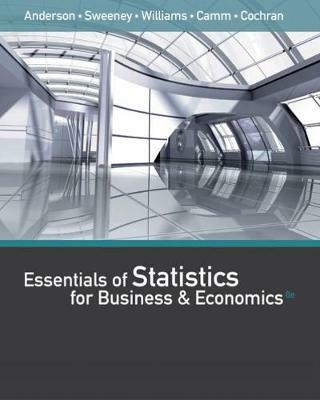 Trust the market-leading ESSENTIALS OF STATISTICS FOR BUSINESS AND ECONOMICS, 8E to give you the foundation in statistics for an edge in today's competitive business world. The book's signature problem-scenario approach and reader-friendly writing provide proven methods, hands-on exercises, and real examples to take you deep into business problems and help you solve them from an intelligent, quantitative perspective. Streamlined to focus on core topics, this new edition offers new case problems, applications, and self-test exercises to help you master key formulas and apply the statistical methods you learn. Comprehensive online support provides MindTap and CengageNOW digital solutions that help you make the most of the course. An online homework tool now includes 'Post-Submission Feedback' or step-by-step calculations that walk you through solutions. Optional chapter appendices provide in-depth coverage of popular statistical software -- Excel© 2016 and Minitab© 17.